A red-shouldered hawk perches on a wire in Brookfield, Connecticut, Jan. 2018. 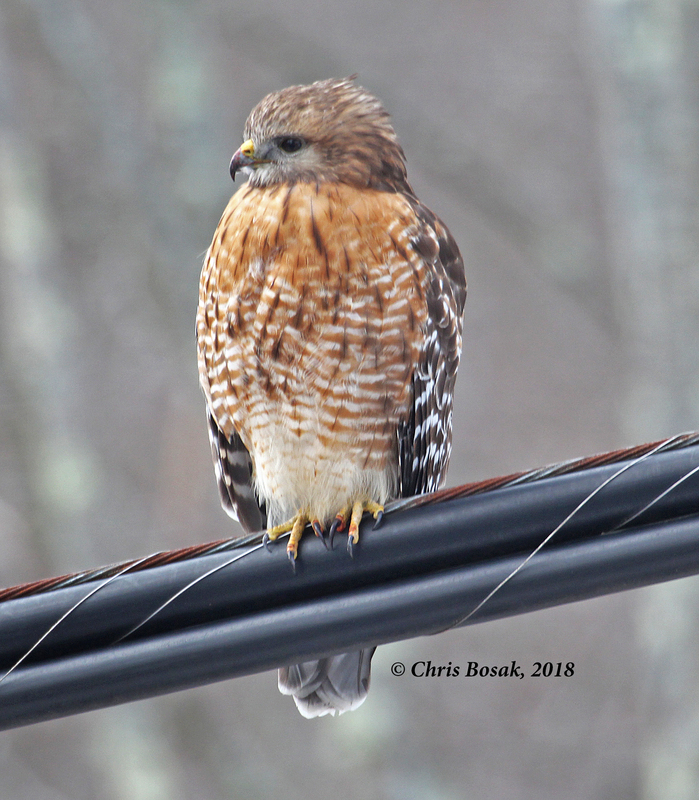 When I drove past this red-shouldered hawk near Brookfield (Conn.) High School, I doubted I would be able to find a place to safely pull off the road and snap a few photos. I had to try, however, so I pulled into parking lot a few dozen yards down the road and started to turn around. I noticed, however, that the parking lot afforded an even better view of the bird and just as close. I’ll take that luck any day. Notice the reddish chest and belly barring, as opposed to the more brownish markings of a broad-winged or red-tailed hawk. This entry was posted in Birds of Prey, Uncategorized and tagged bird on wire, Red-shouldered Hawk by Chris Bosak. Bookmark the permalink.